In the 19th century Danish music life was characterized by steady development following the European mainstream, in spite of the Napoleonic wars and the state bankruptcy of 1813. Mozart’s and Beethoven’s works were regularly performed at concerts of the philharmonic and chamber music societies. The Kongelige Teater and its orchestra, Kongelige Kapel directed by Schall acquired European fame. The Royal Music Academy was founded in Copenhagen and generations of composers – A. P. Berggreen, J. P. E. Hartmann, Niels W. Gade, and Fr. Kuhlau – worked hard to create a Danish romantic musical style rooted in the Viennese classical musical idiom and enriched with national colours. Based on Georg Carstensen’s idea, the first amusement park of the world called Tivoli Gardens was opened in Copenhagen in 1843, with merry-go-round, Ferris wheel, musical stages, a multitude of orchestras, clowns, puppeteers, and fireworks. The uncrowned king of light genres performed there was H. C. Lumbye, the “Scandinavian Strauss”. As a composer and conductor of the Tivoli Gardens orchestra he “naturalized” in a specific manner the popular waltzes, polkas and marches of the Viennese Lanner and Strauss families. The new light-music craze, the so-called promenade concert appeared all of a sudden in several big European towns, in open-air music pavilions and on stage of variety theatres alike. Its program consisted of popular melodies, arrangements, and dance music. A common peculiarity of the orchestras of varied forces was the existence of a considerable brass section: the most famous Parisian promenade orchestra was made up of no less than 48 violins, 14 cornets and 12 trombones. 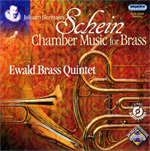 It is therefore small wonder that this popular, characteristic brass sound bringing about new orchestral colours had a far-reaching influence on serious music, on the choice of instruments of the symphonic orchestras and chamber ensembles as well. The career of the violinist and composer Wilhelm Ramsöe (1837-1895) can also be linked with light genres, at least partly. A child prodigy, he entered the stage at fourteen and was only seventeen when he was employed as the conductor of the Miller and Lewini Theatrical Companies touring Denmark and Norway. In 1857 Georg Carstensen, the founder of Tivoli Gardens had a quarrel with the management and decided to establish a rival institution. It was Alhambra where Ramsöe was engaged as music director while Carstensen was looking for a conductor of Lumbye’s calibre. Although Alhambra turned out to be a failure, Ramsöe managed to keep his job until 1864. Meanwhile he was a prolific and successful composer writing and publishing a great number of incidental music for the stage, marches, and polkas. The year 1877 was a turning point in his career. He went to St. Petersburg and was active as the conductor of the Tsarist French Opera to the end of his life. It must have been there that he met the horn music tradition of the Russian court and the brass chamber music fashion springing out of it. It inspired Ramsöe to write the most popular pieces of his oeuvre, as it later turned out. For centuries horns had primarily been used as a hunting accessory in Russia as well. In 1751, however, a certain Jan Mareš, court conductor to Count Narisin, the intendant of the Tsar’s Theatres founded the first court horn orchestra comprising differently tuned natural horns. Each of the first 15, then 30-35 players blew only one sound into their brass or wood, straight or at the end curved, conical instruments. The range of the ensemble can have reached four and a half octaves; its full, slightly vibrated tone reminded the listener of the organ. It shows their popularity that Tsarina Elisabeth was among the first to establish her own horn orchestra, and within short every respectable nobleman had his own hornists. Their program comprised in the first place marches, songs, dances, and character pieces. They played mostly at important events at court – receptions and ceremonies –, often to promote the success of diplomatic negotiations, for they deeply impressed foreign visitors. “Water-music making”, that is serenade music performed on board of ships on the rivers Neva or Fontanka belonged to an even more spectacular field. In the course of the 19th century this typically Russian form of court music fell by and by into the background. As a last experiment, a horn orchestra played at the coronation of Tsar Nicholaus II in 1896 after which the tempest of history made it fall undeservedly into oblivion. However, its influence did not vanish without a trace. 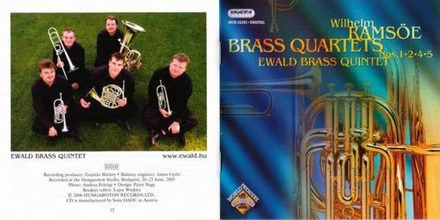 Aliabev, Maurer, and Ramsöe composed a whole series of works expressly for brass instruments and ensembles – character pieces for brass quintet, quartets and concertos –, whereas the St Petersburg tradition survives in the choice of instrument and virtuoso, instrument-like shaping in the compositions of Simon, Ewald, Glazunov, and Glier. 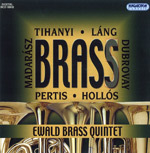 Wilhelm Ramsöe’s magnificent brass quartets transfigured the genre of Viennese classical string quartet to brass sound. They are the composer’s most often performed, most effective and virtuoso compositions. 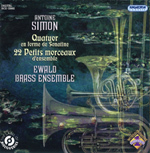 In the quartets on the present recording the horn and the bassoon alternately provide the alto-tenor part to the two trumpets and tuba. Each piece consists of four movements. A peculiarity of the cyclical form of the first two quartets is that the first movement in sonata form is preceded by a festive, slow introduction.